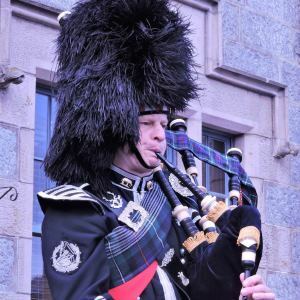 I'm Glyn Morris, an Edinburgh-based bagpiper for hire of 30 years experience and an active playing member of the Fife Police Pipe Band who are at the top of Grade 1. I provide a friendly Bagpiper for Hire service to add Scottish flair and ceremony to your occasion. As a piper I have performed at countless events including weddings, dinners and parties, British Embassy functions and foreign Trade Shows, to name but a few, at home and abroad. Services I offer include piping for Weddings, Burns Suppers, birthday parties, tour groups and corporate events. For Burns Suppers I perform an entertaining Address to the Haggis and I also provide Highland Dancers, pipe bands and ceilidh bands. I often travel abroad to play for Scottish Societies and corporate events promoting Scottish and British products sold overseas. I offer a more comprehensive bagpiper service by also playing Scottish Small Pipes. I believe it is most important that your bagpiper looks the part, as well as sounding it. I wear the No.1 Full Highland Dress and I refuse to wear any kilt wear and uniform accessories which are not of the finest quality. I am confident that there are very few pipers outwith the military who have such fine uniform and know how to wear it. In my pipe band career I’ve won prizes at the top of Grade 1, and in solo competitions I have won against some of the world’s best pipers. I have a great deal of experience gained from playing for many different types of occasion, and I know that no event is the same. I'm happy to work with you and make suggestions to ensure your event is a success.